My first ambassadorial post was to Egypt. I have many memories of this ancient and beautiful country. One is the Mena House Hotel, which I visited many times. Situated at the foot of the spectacular Cheops Pyramid, the hotel is the venue that produced the famous Cairo Declaration. It was published on 27 November 1943 after discussions between the leaders of China, Britain and the United States, and was the master plan for rebuilding international order following the war with Nazi Germany and Japan. The Cairo Declaration was a laudable outcome of the war against both Germany, with its repellent Nazism, and Japan, with its equally repugnant military fascism. It stated in explicit terms that: "all the territories Japan has stolen from the Chinese, such as Manchuria, Formosa (Taiwan) and the Pescadores, shall be restored to the Republic of China. Japan will also be expelled from all other territories she has taken by violence and greed." Less than two years later the Potsdam Proclamation, released on 26 July 1945, reaffirmed that: "The terms of the Cairo Declaration shall be carried out." The Japanese government accepted the Potsdam Proclamation in the Japanese Instrument of Surrender, and pledged to faithfully fulfil its obligations stipulated in the provisions of the Potsdam Proclamation. All of these facts show that in accordance with the Cairo Declaration, the Potsdam Proclamation and the Japanese Instrument of Surrender, Diaoyu Dao, as affiliated islands of Taiwan, should be returned, together with Taiwan, to China. However, up to now Japan still obstinately clings to a colonialist mindset. It is turning a blind eye to the international agreements made at the conclusion of World War II by claiming that Diaoyu Dao is Japan's territory. It reveals that Japan has failed to examine its conscience and remains disappointingly unrepentant about its history of military fascism. Moreover, it attempted to deny the outcomes of the war against fascism and challenge the post-war international order. History shall not be reversed. We must not forget the untold sufferings incurred during World War II. China and Britain are both victims of fascism. We have shared memories and pains. Chinese and British troops fought side by side on the battleground against Japanese military fascism. It is the common responsibility of China and Britain and the entire international community to reaffirm the outcomes of the war against fascism and maintain the post-war international order. Nazism was born in Germany. On December 7, 1970, West German Chancellor Willy Brandt travelled to Poland and dropped to his knees before the monument to the Warsaw Ghetto uprising of 1943. Many in the world were deeply moved by this famous gesture of repentance and apology. The extraordinary courage and sincerity of Germany won it trust and respect. After World War II, German and Japanese attitudes form a stark contrast. Unlike Germany, Japan has never seriously reflected on its military fascist past and made a serious apology. Instead, it tried to reverse the history. Such a remorseless attitude has made it difficult for Japan to earn the trust of its neighbours and the forgiveness of people around the world. Recently Japan has taken a series of provocative steps. In total disregard of the established post World War II agreements, Japan implemented its plan of "purchasing" China's Diaoyu Dao. The so-called purchase of Diaoyu Dao by the Japanese government is illegal and invalid. It can in no way change the fact that Diaoyu Dao is the territory of China. 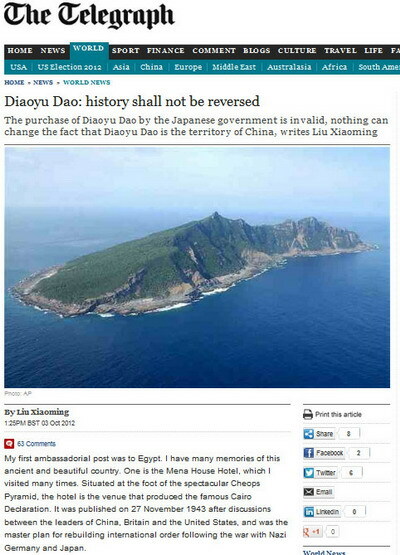 Historical records show it is an indisputable fact that Diaoyu Dao belongs to China. China's Ming and Qing dynasties had always exercised sovereignty over Diaoyu Dao and its affiliated islands. Diaoyu Dao and its affiliated islands were already marked on maps as Chinese territory in the early Ming dynasty. The British authorities supported this sovereignty with maps such as A New Map of China from the Latest Authorities, published in Britain in 1811. Also there is: A Map of China's East Coast: Hong Kong to Gulf of Liao-Tung, compiled by the British Navy in 1877. Both these maps marked Diaoyu Dao as part of China's territory. In 1895 Japan illegally seized Diaoyu Dao and its affiliated islands through the first Sino-Japanese war. In 1951 Japan signed the Treaty of San Francisco with the US and a number of other countries, which in effect put the Ryukyu Islands under American administration. It must be stressed that China was excluded from this treaty and islands handed over to the American administration in this treaty did not include Diaoyu Dao. In 1971 Japan and the US signed the agreement concerning the Ryukyu Islands and the Daito Islands, known as Okinawa Reversion Agreement. This treaty provided that powers of administration over the Ryukyu Islands and Diaoyu Dao would be "returned" to Japan. The Chinese government has consistently opposed these agreements between Japan and the US that excluded China. So, it should be no surprise that China never recognised them. In 1972 China-Japan relations normalised. In 1978 China and Japan signed the treaty of peace and friendship. Chinese and Japanese leaders agreed on shelving the Diaoyu Dao issue and waiting for a future settlement. Without such understanding and consensus, progress of China-Japan relations in the four decades that followed would have been impossible. This year marks forty years of the normalisation of China-Japan relations. It ought to be a propitious year. The two countries had decided to hold a 'Year of Friendly Exchanges' between Chinese and Japanese people and nearly 600 exchange programmes were planned. All these were shelved following Japan's illegal 'purchase' of Diaoyu Dao. The atmosphere of celebration has gone sour. Now the situation over Diaoyu Dao issue is escalating. Japan is the only one to blame. Japan does not even admit the existence of a dispute over Dioayu Dao! Such a position is an outright denial of the understanding and agreement reached between China and Japan. It is imperative that Japan respects history and facts. It is vital that Japan reflect on its mistakes and comes to a clear understanding of the situation. It is critical that Japan displays the political courage to correct its wrongdoings, and respect China's territorial sovereignty.